Abe Goldstein was born on October 12, 1896 in Ohio. 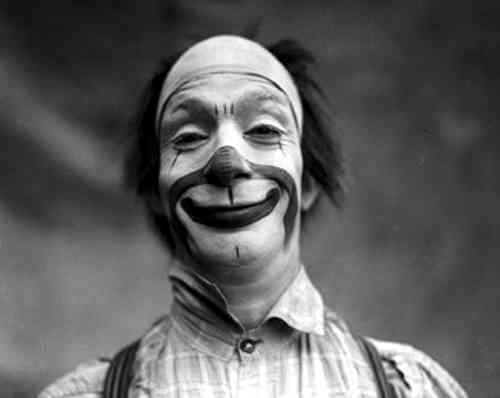 At age 10 Abe discovered he had a talent for clowning. While selling newspapers on the streets of Cincinnati, he would perform acrobatics and stunts to attract attention and increase his sales. At age 16 Abe served in the U.S. Army during World War I where he lost an eye. He wore a glass eye for the remainder of his life which he often joked about. Goldstein appeared as an extra in many of Mack Sennett's "Keystone Kops" films where perhaps he developed his "Korkey the Komic Kop" persona. Abe also appeared in Disney's "Toby Tyler, or Ten Weeks with a Circus" (1960) and "The Fat Man" (1951). Abe is best known as the circus clown cop, he performed in an exaggerated policeman's coat with large brass buttons, a constable's helmet and carrying an oversized nightstick. Abe is also remembered for his comedy dog act. He performed with his dog "Teddy", Goldstein would shoot the dog with a fake gun, te dog would drop to the ground and play dead and the jump to life and bite Abe's rear. Abe continued clowning into his 90s, performing at hospitals and Boy's Clubs in the Los Angeles area. Katherine, Abe's wife of 44 years died in 1985. Abe Goldstein died February 15, 1990 at age 94 in Los Angeles, CA at the Hollywood Community Hospital.